But what the hey ;) I love you guys too much and sometimes even the simple fixins' can be inspiring! A Turkey & Cheese Melt on gluten free bread. Simple enough, right? It really was. I made the sandwich and got it going in the toaster oven to let the cheese melt. 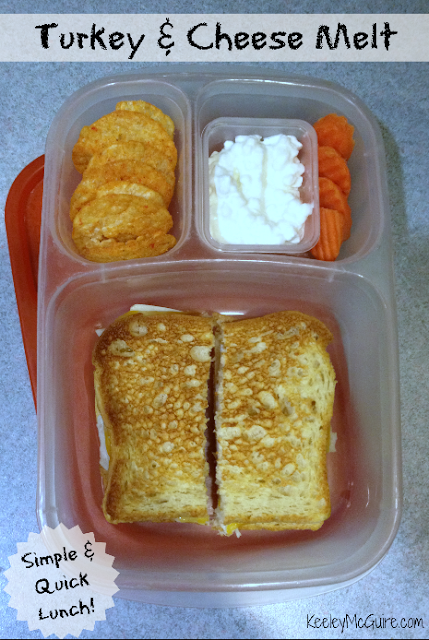 While that was cookin', I filled the other compartments with BBQ PopChips, carrot chips, and a mini dipper of cottage cheese. Wondering how to keep a toasted sandwich from getting soggy in the lunch box? Read the "how to" and tips by clicking HERE.